This red plastic two piece box by Hornady contains both 7M/M TCU dies along with the papers an.. This Hornady manufactured factory sealed red and white cardboard box contains 100 original 35 grain .. This Hornady manufactured red and white cardboard box contains 70 original 35 grain V-Max 22 caliber.. This Hornady manufactured red and white cardboard box contains 100 original 53 grain Match H. P. 22 .. This Hornady manufactured red and white cardboard box contains 66 original 55 grain V-Max Moly coate.. This red plastic two piece box by Hornady contains all three 32 S&W Short dies along with .. This Hornady manufactured red and white cardboard box contains 83 original 100 grain short jacket 30.. This Hornady manufactured red and white cardboard box contains 69 original 150 grain boat tail soft .. This Hornady manufactured factory sealed red and white cardboard box contains 100 original 168 grain.. This early Hornady manufactured white, black, and burnt orange cardboard box contains 100 original 1.. This Hornady manufactured red and white cardboard box contains all 100 original 85 grain hollow poin.. This early Hornady manufactured red and white two piece cardboard box contains all 50 original 275 g.. This Hornady manufactured red and white cardboard box contains all 100 original 170 grain round nose.. This red plastic two piece box by Hornady contains all three 41 Mag dies along with the papers.. This factory sealed red plastic two piece box by Hornady contains both 225 Win dies along with.. This red plastic two piece box by Hornady contains both 256 Winchester dies along with the pap.. This red plastic two piece box by Hornady contains both 270 Rocket dies along with the papers .. This red plastic two piece box by Hornady contains both 303 Savage dies along with the papers .. This red plastic two piece box by Hornady contains both 357/44 B&D dies along with the pap.. This red plastic two piece box by Hornady contains both 378 WBY dies along with the papers and.. This red plastic two piece box by Hornady contains both 460 WBY dies along with the papers and.. This red plastic two piece box by Hornady contains both 5.6 x 52 R dies along with the papers .. This red plastic two piece box by Hornady contains both 7mm WBY dies along with the papers and.. 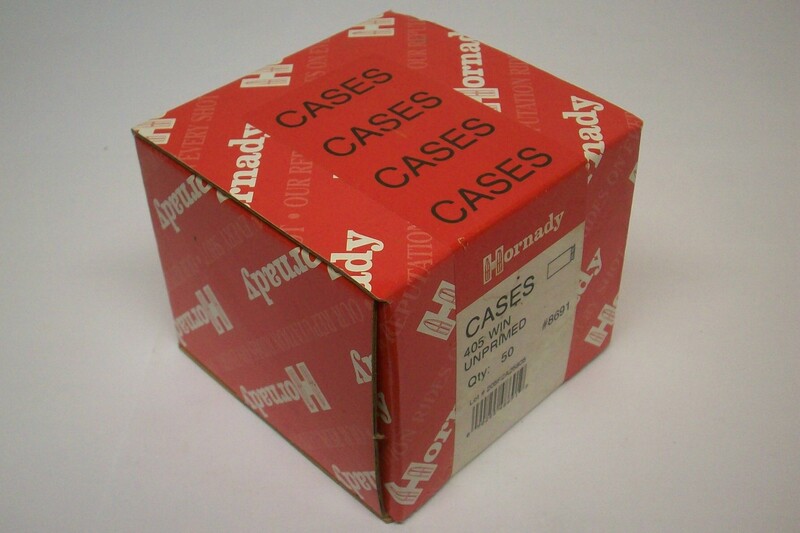 This red plastic two piece box by Hornady contains both 8 x 60S dies along with the papers and.. This red plastic two piece box by Hornady contains both 9.3 x 74R dies along with the papers a.. This Hornady manufactured factory sealed red and white cardboard box contains all 50 original unprim..